A beautiful white egret rises silently as dawn breaks over the marsh. Another egret stands reflected in the water. Soft greens, blues and pinks contribute to the quiet atmosphere of this early morning scene. 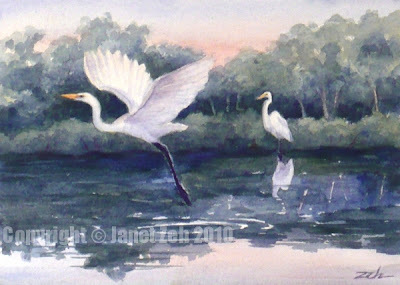 This painting is sold, but you can see more of my bird paintings in my Etsy shop, JanetZeh.Etsy.com.